Another day; another verse novel. This time set in Queenland with more of a YA feel to it. 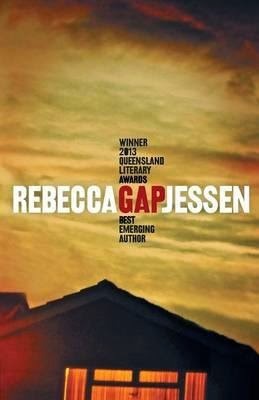 Gap won the 2013 Queensland Literary Award for Jessen as Best Emerging Author. A few years ago I would never have thought that verse novels were my thing. But thanks to some fabulous Aussie children's writers like Steven Herrick and Emma Cameron I have been converted. Jessen also cites Dorothy Porter as one her inspirations; another award winning Aussie poet well-known for verse novels, who I have recently 'discovered'. Ana's life has been spent on the run, on the wrong side of the tracks. But in an effort to help her kid sister from falling into the same trap, Ana cleans herself up and takes over caring for her sister when their dysfunctional mother kicks her out too. But things don't always go to plan. An old school romance is rekindled when the female cop who knocks on Ana's door one night turns out to be an old love. But can she save Ana from her past, her mother and years of bad associations? Not as powerful or as raw with gritty emotion as Porter's work (although to my mind, Porter has set the bar very high! ), but Gap is a very worthy attempt by an emerging young writer. I'll be curious to see what Jessen does next. This post is part of my Australian Women Writers challenge. I haven't heard of this one, or seen it around ( I presume it's new?). It sounds good, I'll look out for it. . Funny how we've both taken to verse novels recently. And there seem to be more around too. I like them too because they're such nice quick reads. And yet powerful somehow because of the format, I don't fully understand the alchemy. Alchemy - perfect choice of word Louise! There is something about the careful choice of words in a verse novel - powerful in their apparent simplicity. It is odd isn't it? It's often more powerful than prose somehow. I guess that's why the writers write them that way. There seems to be a few more around recently, perhaps verse novels will become even more popular in the coming months and years?